Cover: picture sleeve front and back. 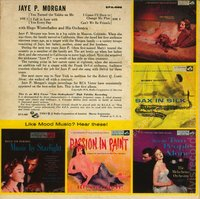 JAYE P. MORGAN in yellow letters. WITH HUGO WINTERHALTER'S ORCHESTRA in white lettering. 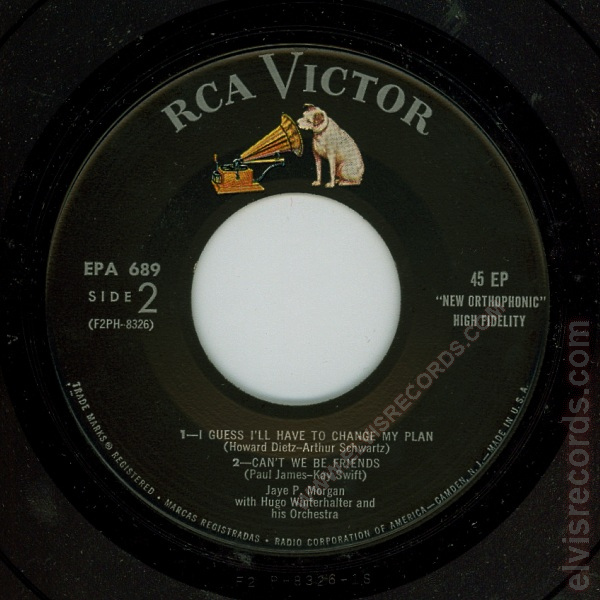 RCA Printed in U.S.A. in lower right corner. RCA VICTOR box in grey and HIS MASTER'S VOICE box in black. A "NEW ORTHOPHONIC" HIGH FIDELITY RECORDING" in all caps. The ad back has "Like Mood Music? Hear these!" printed in the yellow. This record sold 1000 times fewer than Elvis Presley's EPA-992. Assuming that at the time of these numbers that EPA-992 sold 1,000,000 copies, then only 1000 copies sold of this EP. 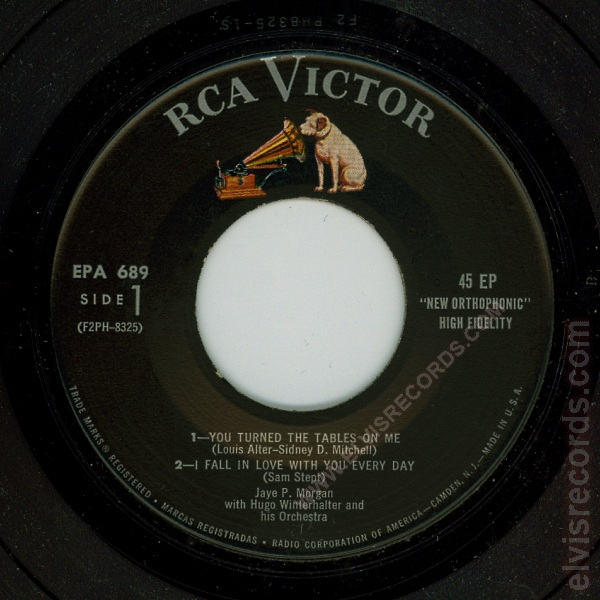 However, according to a December 8, 1956 edition of Billboard Magazine on page 40, "over 500,000 sold in only one month...", this making the EPA-689 even rarer at only 500 copies. In any case, this is a MEGA RARE extended play. It is not even listed in a recent Osborne Cyberguide. 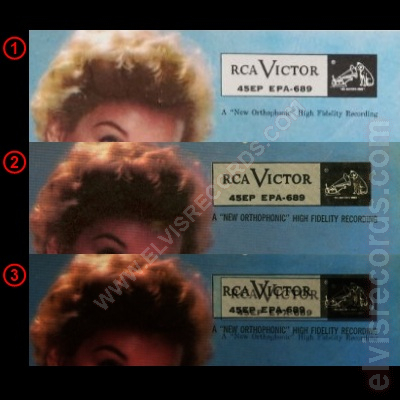 There are a couple of differences between the EPA-689 regular retail issue front cover and that of the promotional issue of RCA Victor EPA-992 /EPA-689 Elvis / Jaye P. Morgan (EP) cover. 1. This is a closeup of part of the promotional cover. The RCA Victor box does not touch the head of Jaye P. Morgan. A "New Orthophonic" High Fidelity Recording is not in all caps. 2. 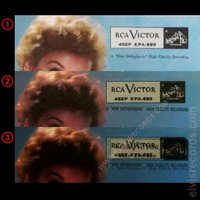 This is a closeup of part of the original retail cover. 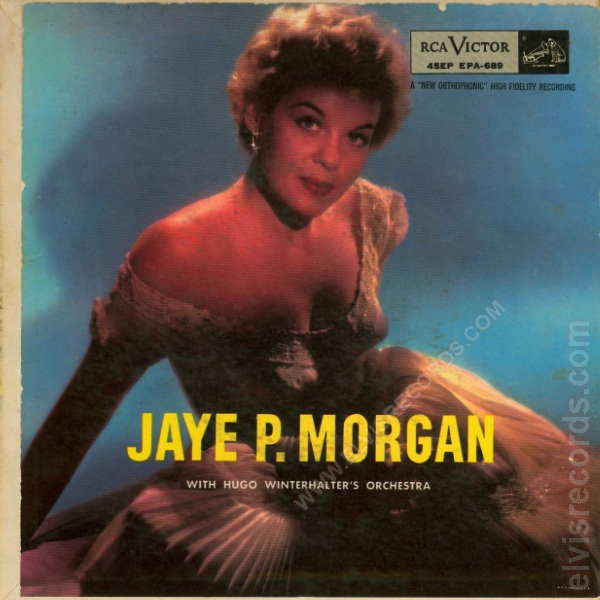 The RCA Victor box touches the head of Jaye P. Morgan. A "NEW ORTHOPHONIC" HIGH FIDELITY RECORDING" is in all caps. 3. This is an overlap of the retail and promotional covers. 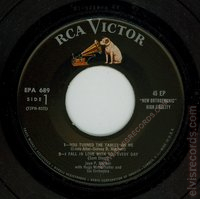 This overlay illustrates the spacing differences between the retail and promotional releases of this release.